Home Breed Information Lab Pointer Mix – Is This The Dog For You? Lab Pointer Mix – Is This The Dog For You? Mix breed dogs can be controversial and the Lab Pointer Mix is no exception. But it’s a mix breed with an interesting background. If there’s one thing that defines the Lab Pointer mix, it’s their sweet temperament. Pointerdor owners say these sturdy dogs are softies at heart and love to please their people. Bred from Labrador Retrievers and Pointers, these puppies are one of the most sought-after breed mixes. and their history goes back long before the term designer dog was coined. If you’re considering getting a Lab Pointer mix, we can help you decide whether or not this is the right dog for you. 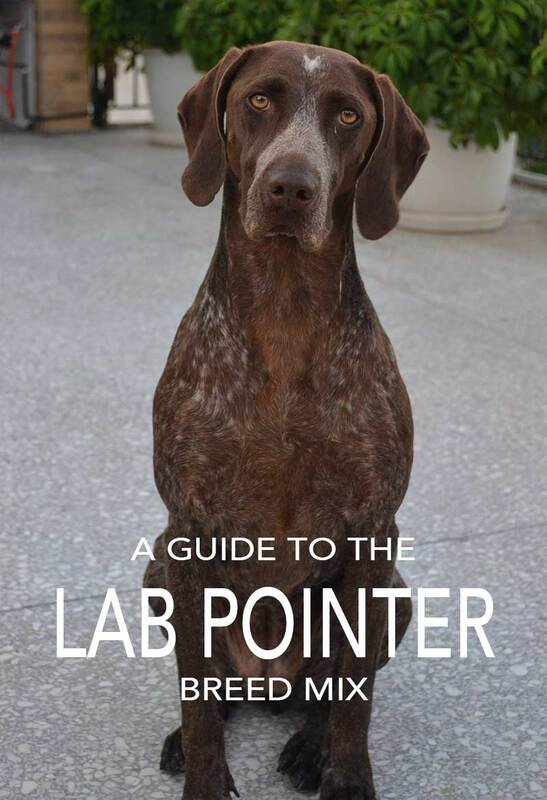 In this ultimate guide, you’ll find out what a Lab Pointer cross is really like, where they came from, how to choose one, and how to make your new puppy a happy, healthy member of the family. Both Labradors and Pointers are gun dogs. Part of the sporting dog group, and many serve dual roles as hunting companions and family pets. Pointers are an ancient breed and were bred to ‘point’ at game. You’ll have seen old paintings with pointers or setters ‘on point’. It’s a classically beautiful pose, with one front paw raised. Often with a second dog backing the first in an identical position. Setters and Pointers perform the same function and were very popular before breech loading guns were invented. They gave the hunter a chance to load their weapon and get close enough to the game to take a shot, before the bird was flushed. These dogs were bred to gallop over huge areas of moorland and open countryside, searching for tiny traces of scent in areas where game birds are few and far between. These are the true Pointers – sometimes called English Pointers. And it’s important that you understand their purpose if you are thinking of buying a puppy with a Pointer parent. These are what is often known as the ‘versatile gundogs’ and have now for the most part taken over from our old breed, the true pointers, as popular hunting companions. They are modern, multi-purpose, gun dogs capable of hunting up game, pointing at it, and retrieving it. Much of the time, when people buy a Lab Pointer Mix they are buying a Lab crossed with a GSP. And for the most part, that is a good thing! Both Labrador Retrievers and German Shorthaired Pointers are eager to please, good-natured and smart. 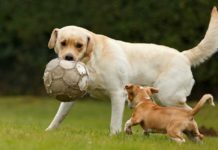 For this reason a German Shorthaired Pointer and Lab mix can be a good choice for an active household that can make plenty of time for play. And who are willing to devote time each day to training their dog. Lab Pointer mix origins – why create a hybrid? 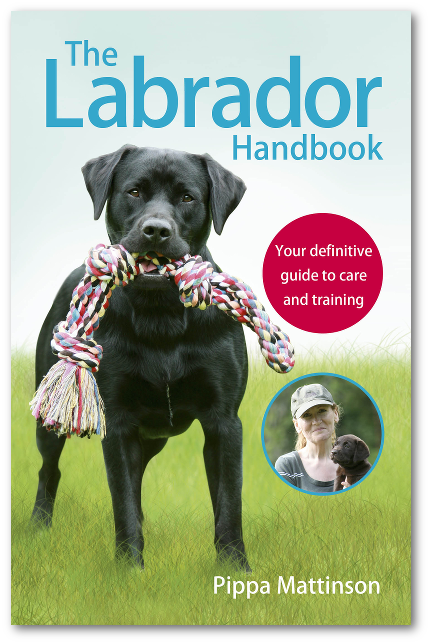 The origins of the Labrador Retriever have been described in some detail in Pippa’s article on the History of the Labrador. To understand the origins of a Lab x Pointer mix, we can begin by going back a few decades. In the late 1990s, so-called “designer dogs” hit the headlines as dog-owners and breeders sought to combine favorite breeds and create a new generation of hybrids. The early crosses were often promoted as having the best attributes of both parents. Claims were made that Labradoodles for example would all be hypoallergenic or at least low shedding like their poodle parent. We now know that this isn’t true. When we cross two very different dog breeds, which attributes each puppy will get from each parent is to some extent a lottery. The puppy could get the best attributes of both parents, or the worst. 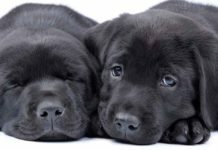 Using two dog breeds from the same group, in this case the sporting group, does however increase the chances that the resulting puppies will be similar, because the parents have similarities too. It is interesting to note that Lab Pointer mix origins, go back much further than the desire for designer puppies. That’s because people in the hunting community have traditionally been happy to experiment with breed crosses that suit their purpose. 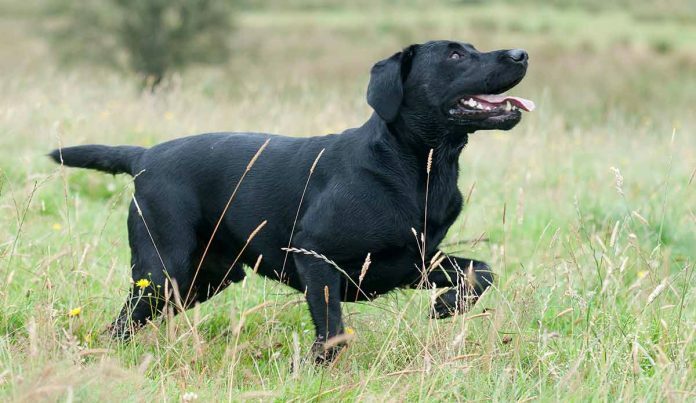 HPRs have probably long been included in the occasional Labrador breeding programme, albeit illicitly, in order to incorporate the pointing instinct into certain lines of retrievers. Both Labs and German Shorthaired Pointers are among the larger of the medium-sized dogs. A Lab crossed with a true Pointer however, is likely to be a taller dog altogether. The true Pointer reaches up to 28 inches in height, and some of his cross-bred puppies may well do the same. 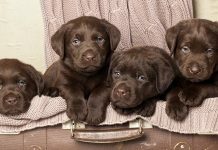 There are just three coat colors for Labrador Retrievers – black, yellow and chocolate. Pointers, on the other hand, can be found in 8 different colors. Including liver, lemon, black or orange. And in combinations of these colors with white. They often have distinctive and beautiful markings with usually a white muzzle with dark ears and eyes. German Pointers come in all kinds of pretty variations of the color liver (a rich dark brown) either solid or mixed with white spots or ticking. In the UK, the GSP is also found in all those variations but with a black base color rather than liver. The Pointer Labrador mix can have any or all of its parent’s colors, depending on which genes get handed down. Within any hybrid litter, you can expect a lot of variation. You could have a black Lab Pointer mix, a chocolate Lab Pointer mix or a yellow Lab Pointer mix. A German Shorthaired Pointer black Lab mix might not necessarily be black. If it favors its Pointer parent, it could be a mix of colors. Even experienced breeders sometimes have a hard time predicting what their new Pointer Labrador pups will look like! When it comes to coat length and texture things are a bit more predicable with a GSP or Pointer cross as both Labs, Pointers, and German Shorthaired Pointers have short fur. The GSP and Pointer coat is very short and easy to care for. Mix pups may take after either. 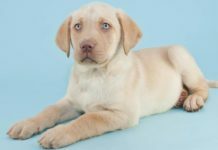 A quick once over with a body brush two or three times a week, and the use of a de-shedding tool when necessary should be sufficient to cover the grooming needs of your Lab Pointer Mix pup. There are two sides to a Labrador x Pointer mix. The sweet-natured family pet, versus the energetic working gun dog. These are loyal, intelligent dogs who can be independently-minded, but are very amenable to training. They form strong bonds with their owners, so can be prone to separation anxiety. And they do best in a stimulating environment – one that challenges them both mentally and physically. While it might seem like this headstrong mutt needs a lot of exercise and attention, just like either of their parent breeds, they will repay you over and over with their affectionate, loving nature. It is worth noting that the pointing breeds, which traditionally had to work much more independently and over greater distances than the retriever breeds, tend to be more independent in nature. The Labrador Retriever is one of the most co-operative dog breeds on the planet. That is why they are so widely used as service and therapy dogs. When you mix a Labrador with a German Short Haired Pointer, you are likely to lose some of this intense desire to co-operate with people, that is the hallmark of the Lab. You may gain some pointing skills, and you may have a dog with better genetic health. But that pure Lab temperament is hard to beat from a training point of view. Coming from two working breeds, Lab Pointers have a lot of energy. They love being outdoors and are ready for anything – running, swimming or hiking. A Labrador or GSP needs at least an hour and a half walking each day. A true Pointer needs far more and many are ideally suited to being exercised on horseback. These pups should also have an enclosed yard where they can run around and stretch their legs on a daily basis. You’ll know if a Lab Pointer isn’t getting enough exercise. They can become destructive, burning off their excess energy by chewing. If your Lab Pointer does damage around the house, consider that the dog may be acting out because they’re not getting the exercise they crave. Exercise is also an important way to keep these high-spirited mutts healthy, and stop them from becoming overweight which could lead to health problems down the road. Any puppy has the potential to inherit health problems carried by its parents. Different breeds are often prone to different diseases, and this means that some cross bred puppies have an advantage in terms of health. If the two parent breeds share a known disease then your puppy is at risk from that disease in just the same way that a purebred puppy is at risk. 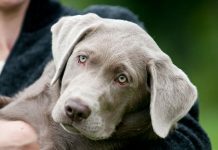 When it comes to Lab Pointers, the ones to watch out for are elbow and hip dysplasia, epilepsy and progressive retinal atrophy (PRA). Elbow and hip dysplasia is a painful condition affecting the animal’s joints which can cause lameness. It can affect both Labs and Pointers. A 2001 study found that weight was a significant risk factor in this dogs with this condition, so it’s important to keep your Lab Pointer trim. Labs and Pointers are also prone to the degenerative eye disorder, PRA. However, this disease, like many others can be screened for and eliminated from the gene pool. All good breeders should be able to provide you with information on your pup’s health history and that of its parents. They should screen for diseases such as PRA as standard. If your mutt is a German Shorthaired Pointer Lab mix, be aware that German Shorthaired Pointers can suffer from eye problems including PRA and cataracts. They can also carry a genetic form of hemophilia known as von Willebrands Disease which prevents blood from clotting. Again, these are diseases that your breeder should screen for with every litter. So you’ve decided that a Lab Pointer is the dog for you. When looking for a breeder it’s important to do your homework. 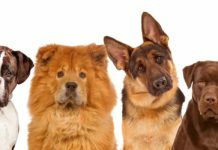 Sadly the growing popularity of hybrid dogs has led a lot of unscrupulous dog breeders to enter the market. A good breeder will be happy to answer all your questions, and let you look around their kennel to meet some Pointer Lab puppies. They’ll also do the necessary health checks and have all the information about your pup’s parentage. Buying from a breeder isn’t the only option when looking for your pup. It can be very rewarding to open your home, and your heart, to a rescue dog. Breed rescues can be found in most regions and often have cross bred dogs and puppies looking for new homes. They will offer a supportive and knowledgeable adoption service. Potential owners should be aware that adopting an unknown dog always carries some risk. Is a Lab Pointer mix the right dog for me? The Labrador Retriever Pointer mix can be a great dog, if matched with the right home. This active mutt enjoys being part of a family and most are good with children over five. Smaller children may get knocked over by large and boisterous gun dog puppies. Young members of the family will enjoy having a furry playmate who’s always ready to be part of a game. Thanks to their spirited nature, Lab Pointers need a lot of exercise, and space. A big back yard is best – somewhere fenced in where they can run and explore. Alert and intelligent, the gun dog breeds and breed mixes are usually a joy to train. Only you can decide if a Lab Pointer is the right pup for your household. Choosing a canine companion is always a big decision, but with some thought and a little planning, you’ll be bringing home your perfect pooch in no time! Previous articleCorgi Lab Mix – The Corgidor!